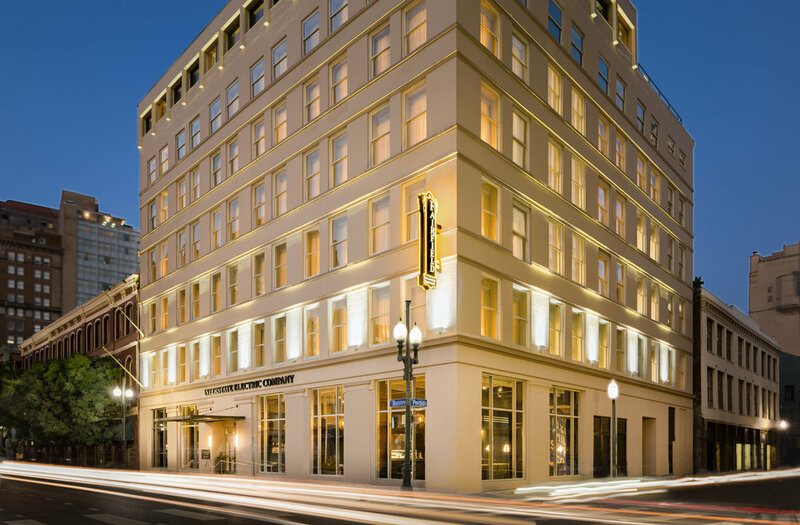 Campo Architects converted the historic Interstate Electric Company Building, located on the corner of Baronne and Perdido, into a custom Fairfield Inn & Suites by Marriott. Originally constructed in 1904, this seven-story building served as a facility for the construction, sale, and storage of automotive equipment, electrical supplies, and lighting fixtures. In 1926, the building was renovated to incorporate commercial tenants. One of those tenants, Collins Piano Co., supplied handcrafted Mason & Hamlin Pianos and Martin Instruments to New Orleans musicians during the early 20th century. In 1994, the building was converted to a Comfort Inn and Suites Hotel. The design team coordinated with Louisiana's State Historic Preservation Office and National Park Service to conserve this nationally registered building's historic elements. The exterior facade was restored to its original 1904 concept. 2016 National Award for Excellence: Associated Builders and Contractors, Inc. Photos provided by New Castle Hotels & Resorts.